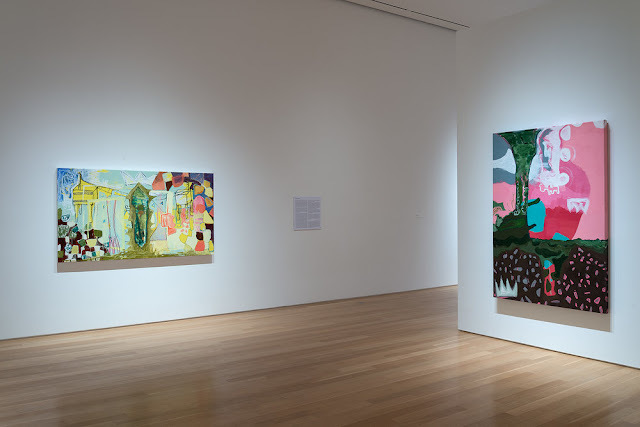 Cristina Muñiz: Installation view of work included in Anxious Abstraction at the Nerman Museum in Overland Park, KS. Painter Cristina Muñiz (web) sits down to talk with Kimberly Ruth for Art Uncovered. Cristina Muñiz is a San Antonio based artist who received her BFA from the Kansas City Art Institute. In 2014, she was a recipient of the Charlotte Street Foundation’s Studio Residency program 2014-2015. Muñiz is a resident artist with The Drugstore studios. Group exhibitions include: Nerman Museum, Overland Park, KS; Drury University, Springfield, MO; Vulpes Bastille Gallery, Kansas City, MO; Paragraph Gallery, Kansas City, MO. Solo exhibitions include: Kiosk Gallery, Kansas City, MO and Project Project, Omaha, NE.